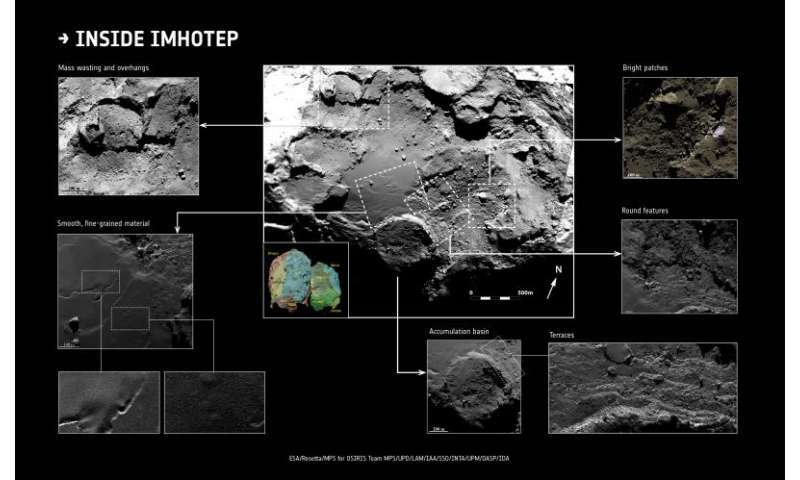 Imhotep is located close to the comet's equator and is relatively flat compared to the overall shape of the nucleus. It caught the attention of scientists on the approach to the comet with its broad smooth area, covering about 0.8 square km, standing out in the first close images of this region. Within this intriguing area, a variety of diverse features can be found. 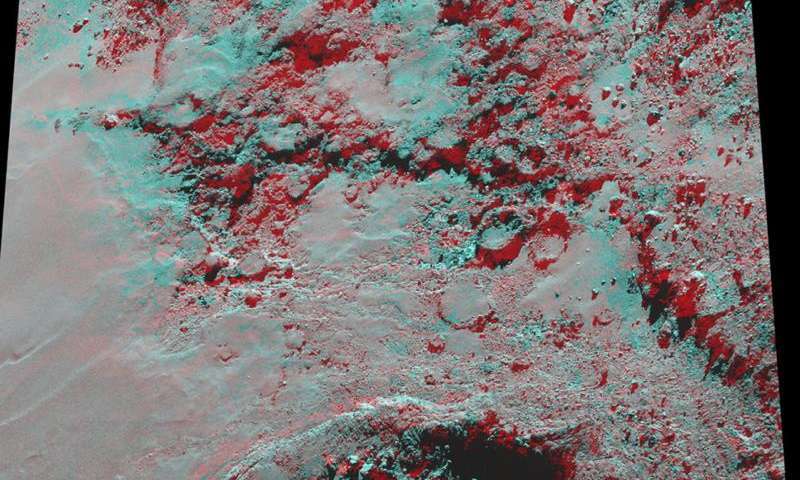 This diverse geomorphology holds fundamental clues to understanding the cometary processes that lead to the formation of the surface as we see it today, and also provides insights for the underlying and possibly primordial structure of the comet. The smooth terrains are considered relatively undisturbed areas that evolve slowly and where material has time to settle and accumulate. Anne-Thérèse and colleagues propose that the fine material originates from the cliffs on the border of the basins where mass wasting occurs. It is then transported by gravity downslope to a flat surface. The wideness of the smooth area can be explained by the progressive retreat of the cliffs over a long time, probably some tens to hundreds of perihelion passages, meaning that the more distant the fine material is from the cliff, the older the deposit is. "Airfall" deposits as a result of activity elsewhere on the comet may also contribute to a small fraction of the dust observed here. The term 'rocky' is used as way to distinguish this terrain from the smooth terrains; in reality, the comet's density is very low, some 470 kg/m^3 , and it is extremely porous. These 'rocky' terrains consist of consolidated material that is exposed at the periphery of Imhotep. They are the sites of erosion, as emphasized by the large numbers of boulders and debris seen close to these outcrops. The erosion observed along the exposed walls is likely triggered by the sublimation of ices, controlled by gravity and exacerbated by fractures. Accumulation basins dominate Imhotep, and are defined as areas where fine material and boulders seem to accumulate preferentially. Six basins have been suggested within Imhotep, covering about two-thirds of this region (other possible accumulation basins lie just outside the defined boundary). Six basins have been suggested, covering about two-thirds of the region. The near-circular appearance of the majority of the basins is interpreted as the surface expression of large primordial voids in the nucleus that existed since the comet's formation. Over time, the overlying surface was weakened by erosion and fracturing, and it eventually collapsed, with erosion over time widening the basin and filling it in with debris. Basin F is observed to be slightly different in that it is extensively fractured, with the fractures pointing towards its interior. Since this pattern is not a feature associated with collapse, it must have formed or been modified in some other way, perhaps by impact or associated with activity, perhaps even by a gas bubble rising from the interior (as already proposed by other scientists for Comet 9P/Tempel 1). 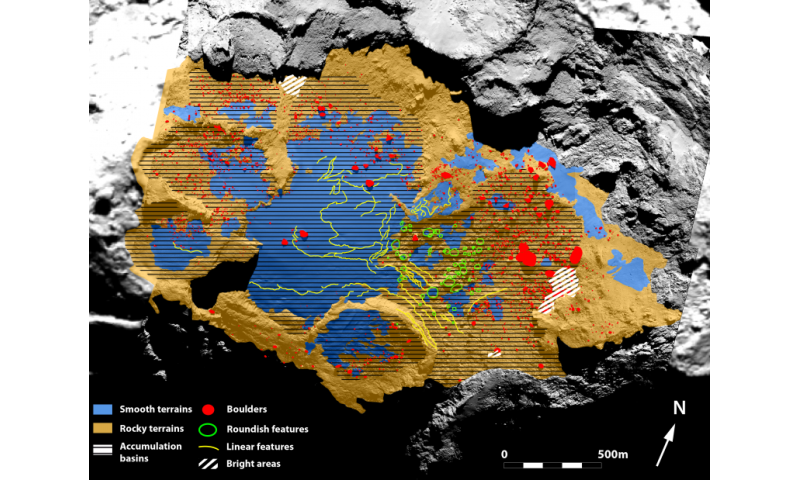 Some 2207 boulders have been counted in Imhotep, with sizes from 2 m (the lowest limit of the observations) to 90 m. They are mostly located at the bottom of slopes and are associated with mass-wasting of more consolidated terrains. A number of large boulders (including the famous Cheops boulder) lie isolated towards the centre of the smooth region. With a size of tens of metres, it is unlikely that they are airfall deposits. Anne-Thérèse's team suggest that the boulders are the remnants of a previous mass wasting event at the foot of an earlier cliff, when the basins were less wide. The boulders have appeared to slightly sink over time, as material accumulated around them. Based on this overview of the geomorphology of Imhotep and of the processes thought to be responsible for its landscape, Anne-Thérèse's team propose a scenario for the formation and evolution of this region. "There are still a lot of mysteries, but now that we are approaching perihelion we will be looking out for any changes on the surface, which will help us understand how this region evolves today," concludes Anne-Thérèse. 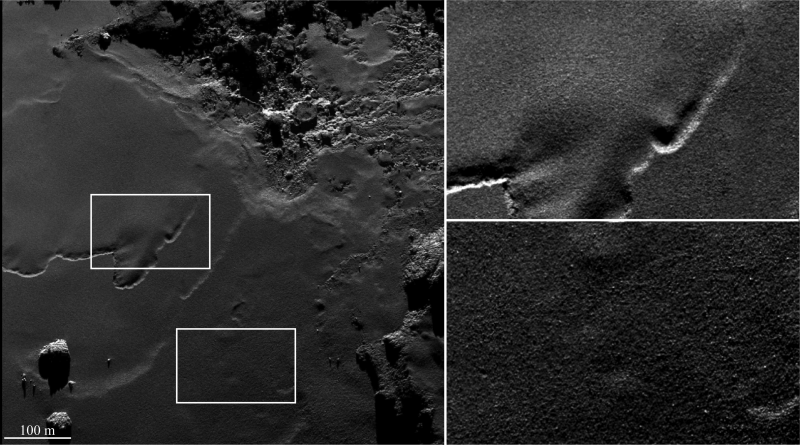 Rosetta gets a peek at Comet 67P's "underside"